What goes on at the Wooden Boat Festival? 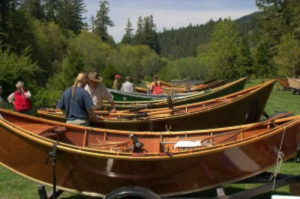 The Annual Wooden Boat Festival is held at the Eagle Rock Lodge (49198 McKenzie Hwy, Vida) and is sponsored/run by the McKenzie River Fishing Guides. The 2017 Event is held on April 22 and the fun starts at 10:00 am and lasts until 5:00 pm – but remember – folks start to leave early (especially if the weather is bad). There will be a short wooden boat float from Finn Rock to Eagle Rock Lodge starting at 9:30 – this is for folks who bring their own boats and want to float/land at the Lodge. There is no official shuttle, we try to help each other get from the lodge back to the boat or pick up trailers after the float in the afternoon. Usual attendees: Eugene,Cascades&Coast (Travel Lane County), McKenzie River Trust, Cascade Family Flyfishers, McKenzie River Chamber of Commerce plus a few extra booths with items that relate to the McKenzie River for sale. An amazing hot dog /hamgurger grill is available for purchase from the McKenzie Guides Association, funds raised support the life jacket loan program sponsored by the Guides. We usually have 40-50 boats depending on the weather . There are no boat rides available for the public.